The tag item is very simple and does not need much explanation. There are only a few properties for a tag. The name of the tag (required). The subtype of the tag. The list may evolve depending on additions by the server administrator. Selecting the proper subtype is important and enables BASE to automatically guess the most likely tag when creating tagged extracts (eg. a Label for a Labeled extract or a Barcode for a Library). See Chapter 12, Item subtypes for more information. 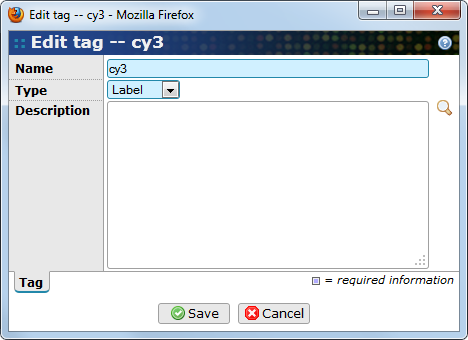 An explaining text or other information associated with the tag.